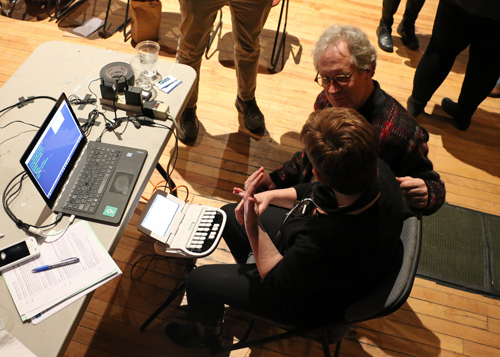 Norma Miller of White Coat Captioning discusses the process of real-time voice-to-text transcription with visitors of the Art of Inclusion workshop. Accessibility and inclusion refer to more than just the physical characteristics of a facility. Policies, programs, services, and effective communication also play a role. The solution is to create a roadmap with organizational buy-in at all levels: board, staff, volunteers, artists, and visitors. Administrators of nonprofit organizations. The workshop will best serve organizations with a primary focus on the arts, but any nonprofit personnel are welcome. Bethel Town Hall 10 a.m. - 3 p.m.
Free for returning Agile Nonprofit organizations, $25 for new participants. Lead instructors: Kathy Gips, New England ADA Center; Sarah Launderville, Vermont Center for Independent Living. The workshop is full, but you may email or call to be added to a waiting list.